Meaning: "Mountain Valley", rendered in German. Established: July 1981. Elevated to barony status on February 23, 1991. Blazon: Sable, a mullet of six points within a laurel wreath, all within a bordure Or. Heraldic officer's title: Valley Pursuivant (registered as "Vally Pursuivant"). In the twilight of their reign Emperor Brennan mac Fearghus and Empress Caoilfhionn inghean Fhaoláin caused Johannes filius Nicholai, to be elevated to the position of Baron Burgental by the popular acclaim of the populus, done on the date of September the Twenty-Second, Two-Thousand and Eighteen, Anno Societatis LII (52). He was preceded in the position by Robert dwe Makminne (Rob MacMinn) and Emma Makilmone (Emma MacMinn), who held the noble role as Robert and Emma from the year Two-Thousand and Twelve, A.S. XLVII (47). Who were preceded in their position by Kai Maclane and Michaelene MacLaine, whom the populs knew as Kai and Michaelene from the year Two-Thousand and one, A.S. XXXVI (36). They followed Tommaltach MacFhiachach and Fiona Siobhan of Kincora whom the populs knew as Tommaltach and Fiona from the year One-Thousand-Nine-hundred and Ninty-Six, A.S. XXXI (31). Who followed Barry MacFadyen and Sonja Dolgorukaja, who lead us as Barry and Sonja from the year One-Thousand-Nine-hundred and Ninty-Four, A.S. XXIX (29). Who followed Beowulf Wyrmcleaw tha Meerstapa as Vicar Beowulf, from One-Thousand-Nine-hundred and Ninty-Four, A.S. XXVIII (28). In the time of his reign King Lucan II, the 51st King of the East, saw that the Shire of Bergental had come into the need of more formal leadership. In his justice he caused the Barony of Bergental to formed of his lands and raising, by acclaim of the populous, Étienne de Lyons and Elwynne Rowenna of Wentworth, known as Étienne and Elwynne to Baron and Baroness. Charging them with the care of his people and lands, on February, Second, in the year One-Thousand-Nine-hundred and Ninty-One, A.S. XXVI (26). In December of 2016, the Barony of Bergental was the second recipient of the Company of Fellowship, given by the hand of Brion III and Anna III. The Company of Fellowship is awarded once per reign to a local group who displays exceptional hospitality, service to the kingdom, and cooperation with other groups. 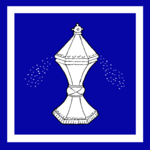 The group receives a banner to display alongside their heraldry: Azure, a saltcellar shedding salt within an orle argent. The initials of the bestowing King and Queen are added to the banner. This award is given for outstanding service within the Barony. This can include being an officer, running events, teaching classes, marshaling or ministering the lists, water-bearing for the fighters of our Barony, picking things up and putting them down as needed, and many other ways spent assisting the Barony and its people in some way. This award is given for excellence in the arts and sciences, either for competence in one specific area or in several. This can include, but is not limited to, weaving, illumination, calligraphy, period garb creation, or any other of the many crafts and skills practiced in the Society. This award is given for prowess in any martial activity, either for competence in one weapons form or in several. This includes all forms of fighting available in the Society, including, but not limited to, heavy combat, fencing, archery, thrown weapons, and equestrian activities. This distinguished award is given to those select members of Bergental who have served, and are still serving, the Barony after at least 10 years. These accomplished individuals must already have at least two of the first three Baronial awards listed to qualify, and are chosen from those who are considered leaders in their fields, and a guiding star to others. Western Massachusetts, comprising the four counties of Franklin, Hampshire, Hampden, and Berkshire. This page was last edited on 17 March 2019, at 00:12.